Sea Star shines as the perfect vessel for your Alaska adventure! 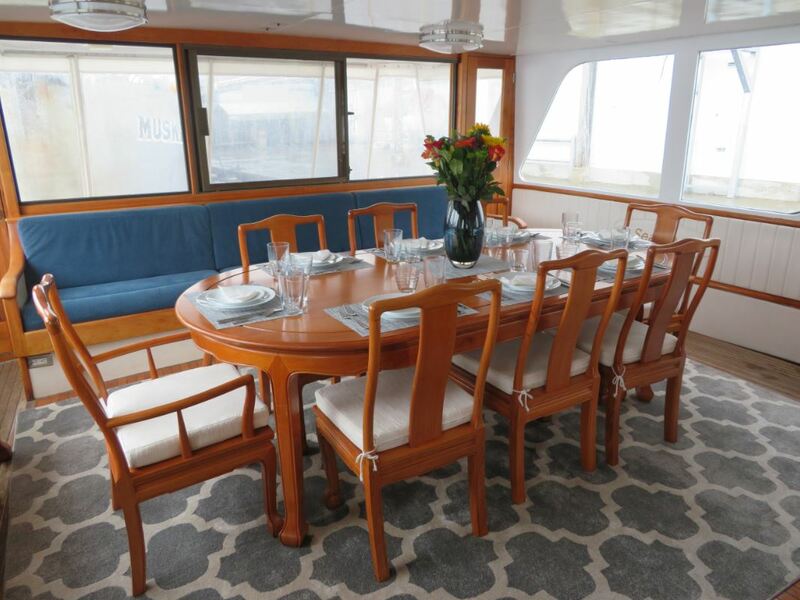 A 1965 classic cruising yacht, Sea Star represents the epitome of comfort, style and safety. A delightful blend of the past and the present, Sea Star provides numerous comfortable and cozy locations to stretch out both inside and on deck, allowing you ample room to experience Alaska at your own pace and on your own terms. Wherever you might be onboard, Sea Star invites you to slow down and take a private moment to appreciate the glory and beauty that is Alaska. This mint condition classic small ship cruising yacht was designed by J.B. Hargrave of West Palm Beach and constructed by the Burger Boat Company in Manitowoc, Wisconsin in 1965. Built as a pleasure craft for the rich and famous, Sea Star (originally Aquarius) was the largest all-welded aluminum yacht of its time. In her time, Sea Star was built for the rich and famous as a luxury yacht cruising vessel. Originally purchased new and named Aquarius in the summer of 1965, by her first owners Mr. and Mrs Jon Dimmick, she was proudly featured in the January 1966 Motor Boating Magazine – Boat Show Special Issue. Sea Star has been well maintained over the decades and still has much of her original beauty and charm throughout. When recently surveyed for insurance purposes, the surveyor stated that he truly felt he had stepped into a time-warp; as she did not look a day over 5 years as a result of her untouched classic charm, beauty and overall condition. Relax in the spacious and cozy Main Salon complete with large viewing windows and ample seating for all guests. Whether easing into the day with a cup of coffee, joining a rousing card game in the afternoon or curling up to watch the day draw to a close, the Main Salon offers something for every guest. The Dining Salon is well appointed with wrap-around windows and a grand teak dining table that expands to accommodate all guests. Also includes a large cushioned settee, wet bar with sink, refrigerator for cold beverages throughout the day, and a water/coffee/tea station. The Dining Salon provides the perfect atmosphere for enjoying a conversation, an appetizer or a sumptuous gourmet meal. This is cruise ship dining at its finest! Come visit with the Captain up in the Pilothouse! While there you can explore the charted route, learn more about the places you are exploring (either on the Kenai Peninsula in Prince William Sound) or even take a turn at the wheel. Or if you prefer, take a seat on the elevated bench seat and enjoy an unrestricted view of the beautiful scenery while also keeping a look out for whales and other exciting Alaska wildlife. Sea Star’s large commercial grade galley comes equipped with all the modern appliances and conveniences our chef needs to create the many elegant and delicious dishes (and treats!) that will delight you throughout the day. We source our ingredients locally, ensuring freshness while also showcasing the bounty of Alaska agriculture and natural resources. Accommodations aboard Sea Star are wonderfully unique for a small ship cruise vessel of this size. Our guest accommodations are comprised of 4 cabins each with a private bathroom (called a head on a ship) and a combination of drawers and closets for your storage convenience. Our lovingly designed cabins and bathrooms (heads) feature opening and screened porthole windows that let the fresh sea breeze into the cabin while keeping those pesky bugs out. Not offered on most similarly-sized small ship cruise vessels, these opening porthole windows help keep your cabin feeling fresh while you stay snuggled warm and cozy. All fine linens, pillows and towels are provided for your carefree comfort. Sea Star’s cozy cabin for one or two, this cabin, named from the Horned Puffin, is perfect for the solo traveler or for two. Includes luxurious linens, ample pillows and opening screened windows. Storage drawers and a stand-up locker are provided for your convenience. The private en-suite bathroom has a shower, additional storage space and many fluffy towels. Cabin 1 is the only cabin offered at the single occupancy rate. Sea Star’s comfortable Sandpiper cabin for two, this cabin provides the perfect spot for two travelers out on an Alaska expedition. Includes luxurious linens, ample pillows and opening screened porthole windows to keep the air fresh. Two dressers and a closet are provided for your convenience. The private en-suite bathroom includes an opening porthole window, electric heater, additional storage space and many fluffy towels. 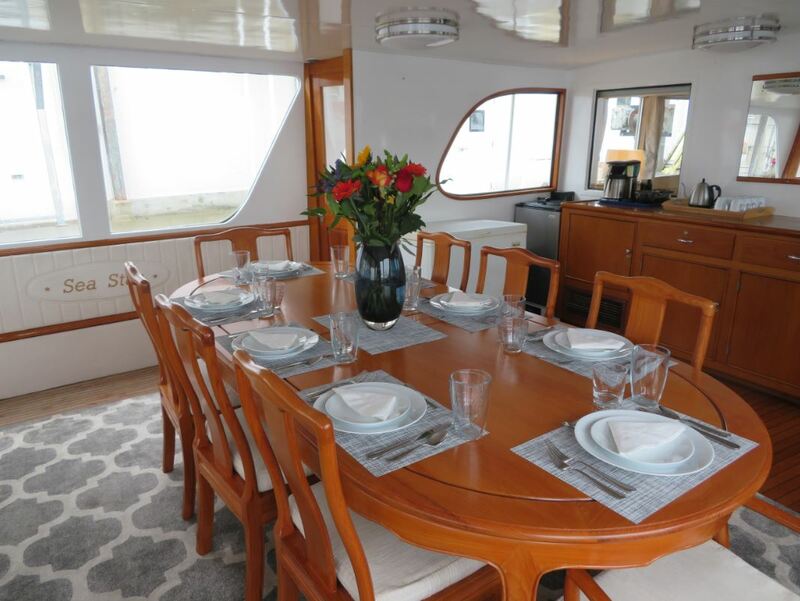 Sea Star’s spacious Kittiwake cabin for three, this cabin is just the place for a couple, a group of friends or even a family out exploring Alaska. Includes multiple opening screened porthole windows to keep the air fresh, deep and luxurious linens and ample pillows for everyone’s comfort. A dresser, storage locker and counter space are provided for your convenience. The private en-suite bathroom includes a tub/shower combination, additional storage space and plenty of fluffy towels. Sea Star’s elegant Osprey cabin for four, this cabin is just the spot for a group of friends, a couple or even a whole family out on an Alaska adventure. Includes opening screened porthole windows to keep the air fresh, deep and luxurious linens and ample pillows for everyone’s comfort. A dresser and a storage locker are provided for your convenience. The private en-suite bathroom includes a shower, additional storage space and plenty of fluffy towels. Sea Star offers a spacious open bow area complete with a spectacular 240-degree view that you can enjoy from a fully cushioned settee situated just in front of the pilothouse. And should the weather turn a little misty, you can continue enjoying Alaska’s wonders by using the covered wrap-around companion ways and after deck area. Whatever the time, temperature or weather, Sea Star provides multiple options for continuing to enjoy the stunning sights and sounds of Alaska. Sea Star has two Tenders that are identified as a rigid inflatable boat (RIB). The primary ship-to-shore RIB is a 16 foot Highfield with a 50 HP Yamaha outboard engine that can carry up to 9 people. The secondary RIB is a 10 foot Achilles RIB with a 10 HP Nissan outboard engine used by the crew for general purpose tasks. Sea Star operates with the following crew company to ensure that our guests experience the best Alaska voyage on this small ship cruise yacht while keeping safety our top priority. The licensed captain (or master) is in charge of all aspects of the vessel’s safe operation any time while at sea or tied to the dock. The captain is also responsible for making sure all the guests are given the highest care and consideration during their sea adventure. The captain of Sea Star is required, by federal law, to hold United States Coast Guard (USCG)-issued 200 Gross Register Tons (GRT) Master Merchant Mariner Credential (MMC) for self-propelled vessels upon near coastal waters. During the nonstop Inside Passage cruise (between Washington and Alaska), the USCG licensed mate is responsible for the ship’s operations when the captain has exceeded 12 hours of work in a 24 hour period. This time limit is a federal legal requirement but also ensures the safety of the ship, its crew and our guests while at sea. Therefore, during the Inside Passage cruise Sea Star will have a mate holding the necessary USCG-issued MMC; specifically a 200 GRT Mate MMC for self-propelled vessels upon inland or near coastal waters. The engineer oversees the full maintenance and operation of all the electrical and mechanical systems including the two main propulsion engines and electrical generation systems. The engineer also assists in deck responsibilities during departures and landings and supports the naturalist/guide and the guests as needed to ensure a quality cruise experience. The chef has the most demanding and challenging task of all. Early mornings and long days, our chef continuously creates delicious and healthy 5-star meals for all to enjoy. By using only the finest and freshest ingredients available (including local and organic Alaskan seafood), the chef ensures that every meal is a true food connoisseur’s delight, not to mention a great way to begin and end any adventurous day on the high seas. The chef will also work hard to provide you with a quick snack as needed as well as accommodate any special dietary needs. The certified naturalist/guide provides information about the surrounding geology, wildlife and history of the cruising areas of Alaska while also offering guided sea kayaking, beachcombing and hiking excursions. The naturalist/guide provides “leave no trace” excursions (and education) to help preserve the pristine ecosystem for future visitors. Our deckhand does a little bit of everything. From helping out in the engine room, throwing lines, assisting in the galley, or making sure there is enough coffee, snacks or an extra pillow, our deckhand is responsible for safe deck operations and making sure the guests are well cared for throughout the day.